“Françoise, if a woman is condemned to death by hanging, she must marry the hangman. That will save her life.” So explains Madame Pommereau to her servant Françoise, neither realizing that this seemingly insignificant fact will become the most important bit of advice Françoise was ever told. 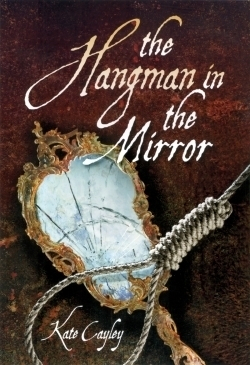 A fictionalized account of Françoise Laurent, who lived in New France in the mid 1700s, The Hangman in the Mirror does everything good historical fiction should—give the reader a tremendously detailed sense of time and place while rendering the sites and smells of the era through the eyes of a protagonist whose emotions are relatable to a modern audience. Françoise, just fifteen when the book opens, grows up in poverty, the daughter of a prostitute turned washer woman and an alcoholic solider. Cayley quickly sets up Françoise’s dissatisfaction with the state she lives in, but more than the hunger and squalor she must endure she hates that there seems to be no road out, no promise of the possibility of upward mobility. When both her parents die suddenly, she’s able, against expectations, to find work as a maid for a wealthy household, a job that will guarantee her a warm bed, good food, and clean, neat clothes. Yet soon Françoise again feels stuck in place with no future but that of a servant, and in her frustration, she steals one of her mistress’s gloves. When the theft is discovered, Françoise is sentenced to hang. In the face of death, she remembers what her mistress once told her, and begins to hope there might be a way out yet. Françoise is a character the reader roots for, impressed by her will and floored by her determination in the face of seemingly impossible situations. You can also feel her anger, anger at her situation, at the callousness of others, and at the wealth and status that is given rather than earned. This is YA fiction with a gutsy teen who has won the right to be bitter about the world. The power of this book is in Françoise’s well drawn raw emotion. Though this is Kate Cayley’s first foray into young adult literature, she’s already an accomplished playwright. She wrote and directed a play based on Françoise called The Hanging of Françoise Laurent. The Hangman in the Mirror will have make you feel lucky for your bed and last night’s dinner, but more than that, it proves that in every era there were people dissatisfied with the status quo, those willing to do something to change their situation rather than sit and wait for someone to change it for them.